Greenhouse equipment invented by a grower for a grower. 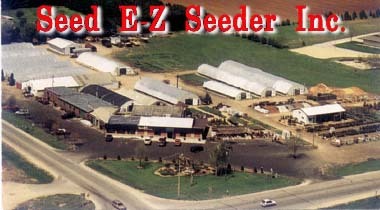 Seed E-Z Seeder is a vacuum seeder that will do 3 to 5 flats a minute, plug trays or cell packs. Seed your annuals, perennials, micro greens, grasses and trees in less time. Save time and money with the ease and accuracy of this seeder. Seed Counter. Any amount up to 1,000 seeds. The germination chamber gives you a better germination. Save on your seed bill. Known as a “sweat chamber” it has a double bronze poly covering. Dibble boards are available for seeding and transplanting. Plug Poppers take all the work out of transplanting. Whether you are agriculture, horticulture, hydroponics, growing for retail or for in your fields, our equipment will boost your profits. Ph: 608-355-0663 Toll Free: 1-800-448-9371 or Fax: 1-608-355-2097Email Us: tesch@sezsdr.comIf you have not received a response within 24 hoursplease contact us again.